Around 10 years ago, our good friend Judy Anderson turned us on to the wonderful Moomintroll series written by Finnish author Tove Jansson. Eberle & I have read — & love—them all. For quite some time, we’d also discussed with Judy the possibility of her adapting one of these books for the stage, with Eberle & I providing the soundtrack. It seems that almost from the very start we all settled on Moominpappa at Sea (the next-to-last book in the series) as the story we wanted to do. We all were involved in other projects, however—Eberle & I with the Alice in Wonder Band, then later Five & Dime Jazz & the Shipman films; Judy with all her many Alpine Playhouse pursuits. Finally in 2007 we decided we weren’t getting any younger (we actually sort of knew that beforehand), & targeted ’08 as the year to produce Moominpappa at Sea as the Alpine Playhouse’s summer production. Gayle Dixon, an extraordinary worker with fabrics, papier-maché, & lots of other media for costumes & props, also joined the project. Gayle has a long history of creating costumes, masks, & props for Judy’s Alpine Playhouse productions, including ones we’ve been involved with, such as Alice in Wonderland & Rootabaga Stories. The project was generously supported by the Idaho Commission on the Arts & the National Endowment for the Arts, & also has been helped by the McCall Finnish Ladies Aid Society. 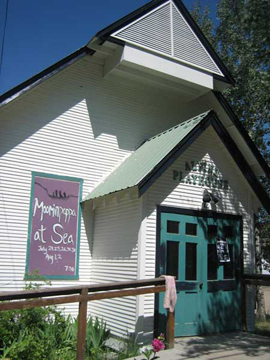 The play was performed at the Alpine Playhouse, McCall, Idaho, July 24-July 26 & July 30-August 2 2008. “Moominpappa at Sea” was the penultimate novel in the series; it was written in 1965. The book, like “Moominvalley in November” & “Tales from Moominvalley,” is a departure from the lighter mood of the earlier Moomin books, & depicts a family in crisis as the Moomins move from their beloved Moominvalley to a deserted island in the sea, where they occupy a lighthouse that doesn’t work. However, Jansson is able to turn this story into a compelling tale of redemption. Here are several mp3's of music Eberle & I created for the play. Hope you enjoy! Of course, all songs are © Plum Alley Productions 2007-2008.